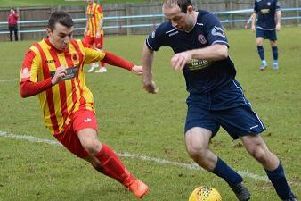 There was further frustration for Kilsyth Rangers as they went down to Dalry. 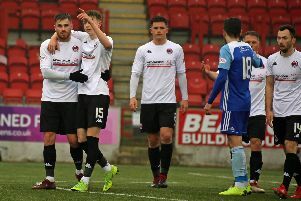 Kilsyth Rangers and their fans suffered another frustrating away day in Ayrshire on Saturday. Rangers' poor away record continued as they went down 1-0 to Dalry Thistle, despite dominating the game which was played on a very cold, but sunny day with a biting east wind making football difficult for both teams. It was a virtually unchanged lineup from the side which has been scoring freely in recent games. Early play was fairly even although neither goalkeeper had much to do in the first twenty minutes or so. A shot from Cashmore for Dalry was just wide of its mark but that was the only near thing. Rangers had much more of the pressure as the first half continued but Fisher in the home goal was never seriously troubled and the half-time whistle came with no scoring and none seemingly likely. The visitors had the breeze behind them for the second half but really it was of little help to either side. Rangers again had the bulk of the pressure but were not getting any shots on target, Dalry were defending very well and numerous attempts were either blocked or easily dealt with by Fisher. Phil Dolan tried a few shots from distance for Kilsyth, but without reward. Then, with 20 minutes remaining, a free-kick to Dalry was put on to the underside of the crossbar by Tait and came back out only to be knocked in by Loughhead to put the home side ahead. Rangers redoubled their efforts to get through the home defence but with no more success than previously and it all ended with Dalry probably just deserving of their win by merit of good defending and taking their one chance when it arose.